Generally attributed to Mark Twain, this is just as true to day as it was in the 1800s. Consider California and its increasingly onerous restrictions on water usage. Water is an essential ingredient of life, and businesses require reliable and economic supplies of water in order to operate. California’s apparent inability to effectively manage its water resources is likely to have far reaching implications for population and business activity. Water shortages, in many parts of the world, including California, tend to be cyclical, with years of plenty followed by years of drought. The solutions are not complex. 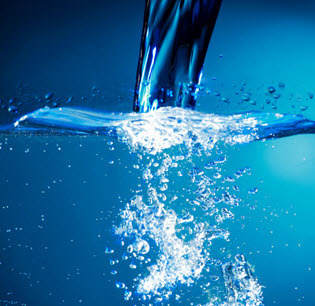 Technologies for producing potable water from sea water and other sources are well known, economic, and proven in arid areas around the world. Water problems are almost always political. Consider the wrangling over the allocation of California’s limited supplies between environmental, agricultural, and general consumption, for example. Or, the not in my back yard approach to desalination projects. Investors should stay tuned. The recent increase in California’s problems have yet to trigger major movements in population or capital investment, but the full impact of the current restrictions on water use have not been fully felt. Moreover, there does not appear to be any movement towards a comprehensive solution. Walter joined Sigma in 2003 and has more than 50 years of experience in security analysis, equity research and investment banking, including 12 years at National Bank of Detroit (now JPMorgan Chase) and 33 years at UBS AG/Paine Webber. Walter is a graduate of the University of Wisconsin with a degree in Economics. He earned the Chartered Financial Analyst (CFA®) designation in 1966 and has successfully completed the General Securities Representative Series 7 examination. 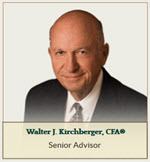 Walter primarily serves as a research consultant and advisor to Sigma’s Investment Committee. Walter is a member of CFA® Institute, the CFA® Society of Detroit and serves on the Editorial Advisory and Securities Review Committees of the National Association of Investors Corp’s magazine, Better Investing. 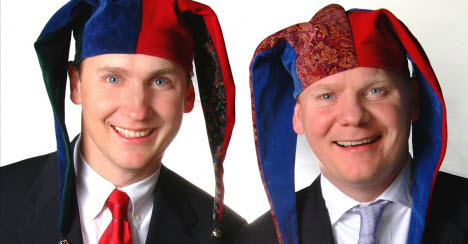 I have fond memories of Walter Kirchberger and Bob Bilkie (CEO, Sigma Investment Counselors) and their considerable contributions to the Better Investing editorial advisory team. As many of you know, investment club champion George Nicholson, Jr. personally selected the stocks for the monthly features in the magazine from 1951 until the mid-1970s when he sought to bring some external perspectives and ideas to a nation of long-term investors. In my years on the stock selection committee, I was impressed by the ideas and performance results of both of these guys. Walter is the classic independent analyst — serving in investment banking roles while operating out of Detroit. Some would say sheltered from the chaos and we’ve spent time talking about how “boondocks” can be an asset, an oasis from the noise. I recall that he had a few favorite themes. One was a general reluctance/avoidance of healthcare stocks. Walter didn’t like the vulnerability of the playing field to the whims of unbridled politics. A second theme was WATER and the reality that a vital resource will present actionable/investable opportunities if you remain vigilant. Some of you “bristled” at our November 2009 selection of Aqua America (WTR) as a Solomon Select feature. We received an unusually high number of opinions that we’d drifted and that we really needed to pay more attention to growth stocks, etc. etc. etc. It was Walter Kirchberger who I thought of as I gritted my teeth and hoped for the best. As the accompanying graphic shows, Aqua America proceeded to significantly outperform the market over the next couple of years. I don’t know whether opportunity will surface in this charging market of the last several years, but it’s time for a deeper dive into water-related industries and companies. Revenue growth is a function of population and inflation — in general. Walter is right, there are some hiccups and bubbles along the way. Over the long term, the average sales growth for the industry is 4-5%. In the absence of growth, for legitimate infrastructure reasons, the average current yield for the Water Utility industry is 3.0%. It’s here that we may see some of the pressures and turbulence (and perhaps even opportunity) mentioned by Walter. This trend has been in place for some time and shows no sign of slowing. Greater efficiencies combine with concerns about supply. Might this be a situation similar to the opportunistic purchase of railroads — citing the reality that no more railroads will be built. In that same line of thinking, industry consolidation and optimization appears to be well underway. The long-term projected industry net margin by Value Line is 16.8%. The EPS stability for the Water Utility industry is a relatively high 77. This is a case where — supported by the trend in the accompanying graphic — the future estimates of net margins in specific stock studies could actually be boosted slightly. The industry average P/E is 20x with relatively small variations. There are gulps and hiccups along the way but the long-term characteristic is quite steady. The average quality ranking is 78, ranging from a high of 95 for Connecticut Water Service (CTWS) to a low of 56 for American Water Works (AWK) — the gorilla in the group. Celgene seeks to deliver truly innovative and life-changing drugs for patients. This major pharmaceutical company focuses on the discovery, development and commercialization of products for the treatment of cancer and other severe immune inflammatory conditions. This one is worth a closer look. Celgene (CELG) ranks at the top of the list for this week’s update batch based on the combination of return forecast (PAR) and quality rating. But the long-term low total return forecast via Value Line is -5%! What gives? This provides an opportunity for a closer look at the consensus aspect of what we do. Weekly Update Summary (Stocks to Study). This listing accompanies every batch update on Monday morning. It represents the consensus-based forecast based on a number of favorite sources. Thanks for the question. I was really hoping that someone would ask. 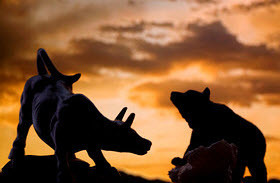 With any forecast, it really does come down to the three judgment milestones and your question can basically be framed by seeking differences between Value Line, your own personal study and perhaps the analyst consensus. 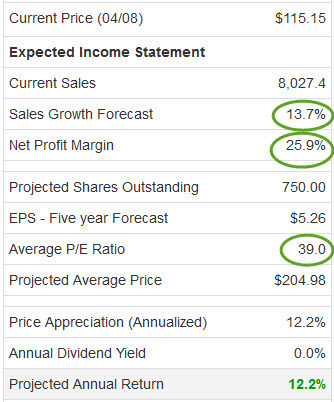 The first place you can turn for these comparisons after the batch update is the Company Report page (excerpt/snapshot shown here). Remember, these are the consensus estimates based on a number of sources. The influences include: Value Line, Standard & Poor’s, Morningstar, the Analyst Consensus Estimates and to some degree, Goldman Sachs (although this is a work in progress, more on that in a minute). The next step is to check them versus the Value Line assumptions to see if we can determine where the differences/variances are — because there’s a world of difference between a -5% forecast and a double-digit forecast. The date on the Value Line company report and our batch update will say April 10, 2015. But the Value Line analysis was performed on 3/30/2015 — something we can determine by finding the date that corresponds with $120.02 here Keep in mind that the Value Line-based low total return forecast is adjusted for (1) change in price and (2) change in time horizon when published at MANIFEST. Sales Growth Forecast: Although Value Line displays 13.5% in the Annual Rates box … the growth rate for the 3-5 year time horizon is (13000/9000)^(1/4)-1 = 9.6%. (Keep in mind that the Annual Rates box data can be greatly distorted by mergers, acquisitions and/or divestitures.) The growth rate displayed in the Business Model (visual analysis) is 13.7%. 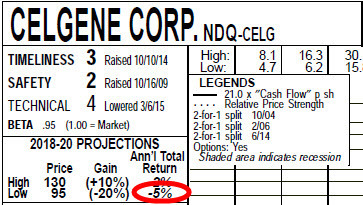 I think most of us would be comfortable with expectations of 10-12% for Celgene. Profitability: These are identical. Nothing to see here. Projected Average P/E Ratio: Here’s where the disparate opinions kick in. Value Line is using 26×. Morningstar sees the stock as currently relatively fairly valued at a P/E of 39.5x or 47.9x … and Standard & Poor’s actually sees CELG with a price-to-fair value of 78%. This is the crux. And it’s probably the basis for Celgene (CELG) being massacred and being the stock with the worst (avoid like the plague) rating over at Goldman Sachs. Goldman probably has a lower projected P/E ratio than Value Line for their long-term forecast. It’s clear by their 1-year outlook that they think P/E decay could even come “home to roost” during the next year. I realize that most of us are loathe to go above 30x … perhaps 35x … for a long-term P/E expectation — and this is good policy. For my own study, I’d avoid using 39x — but, for now, that does represent the consensus. Who’s right? Time will tell, but this company is successfully navigating and delivering in a challenging but promising and desperately needed environment.